While visiting Istanbul a must see is the Sultanahmet Mosque, or Blue Mosque at it is more commonly called. Looking down you will see this carpet at Blue Mosque, featuring a beautiful floral design. 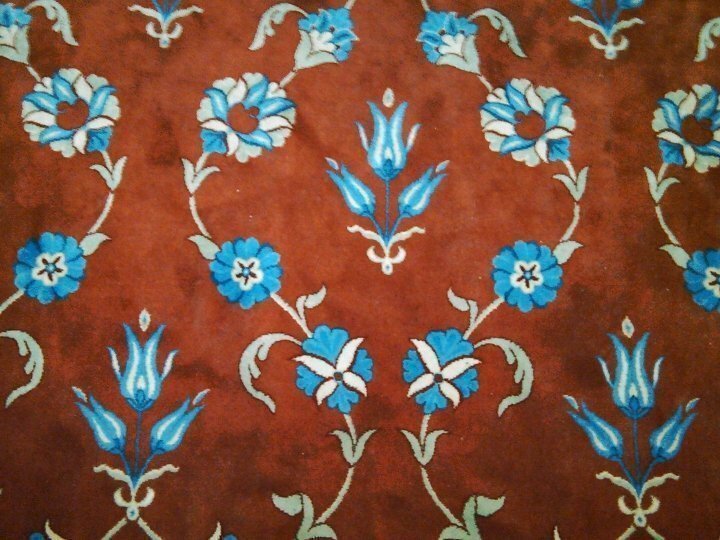 The carpet depicts blue tulips and other flowers also in shades of blue against a dark red background. Visiting the Blue Mosque is one of the most popular tourist attractions in Istanbul and I highly recommend you visit. Also be sure to visit Topkapi Palace, and the Archaeological Museum where you can see the Gate of Ishtar. Istanbul is one of my favorite cities for travel solo in the world! Known as the city where East meets West, Istanbul is partially in Europe and also in Asia. So you can visit two continents within one city. Enjoying visits in the spring, summer, and autumn, each season having it’s own charm and each time leaving me wanting to spend more time in the great city of Istanbul. Now let’s have a look at what it’s like to visit the Blue Mosque. One of the most popular tourist sites in Istanbul, the Sultanahmet Mosque, built between 1609 and 1616 under the rule of King Ahmed I.
Popularly known as the Blue Mosque due to the 20,000 hand made tiles adoring the interior walls of the mosque. The extraordinary architecture of the mosque features six minarets, five main domes, and eight secondary domes. Over 200 stained glass windows bring some natural light indoors. Another famous piece of architecture in Istanbul, the Hagia Sophia, sits across from the Blue Mosque. Although the Hagia Sophia, first an Orthodox church and later a mosque, is now a museum rather than a religious building. 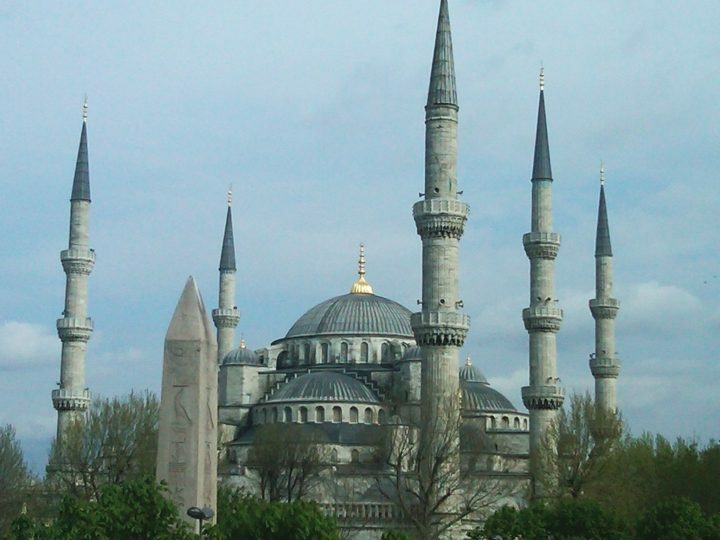 Sultan Ahmed Mosque functions as a mosque but also allows tourists to visit at certain times. There are five calls to prayer each day and the Blue Mosque closes to tourists for 90 minutes during each call to prayer. The first prayer time is at sunrise and the last at sunset. You will hear the Muezzin (a man who calls Muslims to prayer from the minaret of a mosque) throughout the Sultanahmet neighborhood before each prayer time. Even though you cannot go into the mosque during the prayer time I highly recommend visiting the plaza in between Blue Mosque and Hagia Sophia so you may hear the call to prayer close by. There is no entrance fee for visiting the mosque but you can make a donation if you like. Follow these simple rules of etiquette for visiting the Blue Mosque or any other mosque that you may attend. Appropriate dress calls for no shorts and no bare legs for men or women and all women will cover their hair with a scarf. Either bring your own head covering or use the scarves provided at the mosque. Place the scarf loosely over your head and allow it to hang down to cover your shoulders. Remove your shoes and place them in a plastic bag (provided at the entrance) and do not bring any food or drink into the mosque. Respect the people who are praying by avoiding taking photos or staring at them. Avoid using flash photography while in the mosque. Be quiet and remember you are a guest in a house of worship. When you leave the mosque return the headscarf and place the plastic bag from your shoes into one of the bins provided.